If you believe, as I do, that chocolate and raspberry is a flavor combination made in heaven, you will want to try these delicious Raspberry filled Chocolate Thumbprints. They are a great alternative to traditional jam thumbprint cookies that are perfect for chocolate lovers. These cookies bake up moist and cakey and are not too sweet since you use unsweetened chocolate in the dough. Raspberry filled Chocolate Thumbprint Cookies are especially wonderful holiday cookies - perfect for Valentine's Day, Halloween, and Christmas. In a medium bowl stir together the flour, baking soda, and salt until well combined and then set aside. In a large microwave safe bowl place the chocolate and butter. Microwave on high for 1 to 2 minutes. Stir until mixture is melted and smooth. Whisk in the cream cheese until well blended. Add 1 cup of sugar, egg, and vanilla and mix well. Refrigerate at least 15 minutes until the dough is chilled enough to easily be shaped into balls. When you are ready to bake, position an oven rack in the center of the oven and preheat the oven to 375F degrees. Line 2 or 3 baking sheets with parchment paper. Alternatively, bake on ungreased cookie sheets. Shape portions of dough into 1-inch balls and roll them in remaining 1/4 cup sugar. Place balls on baking sheets at least 2 inches apart. Press your thumb or index finger into the center of each cookie to make an indentation that is deep enough to hold the jam. The back of a round 1/4-teaspoon measuring spoon can be used to make the indentation if you prefer. Fill each indentation with about 1/4 teaspoon of raspberry jam. Bake one cookie sheet at a time in the center of the oven until set, about 8 to 10 minutes. Remove from the oven and cool cookies on the sheet for 1 to 2 minutes then transfer the cookies to wire racks to cool completely. This recipe makes about 4 1/2 dozen Chocolate Thumbprint Cookies. Here's fun, easy and versatile recipe for thumprint cookies. The best part about this recipe is that you can easily substitute the traditional milk chocolate Hershey's Kiss with your favorite Kiss: Milk Chocolate with Almonds, Special Dark Chocolate, Hugs, Caramel, Meltaway Center or Air Delight. In a small mixing bowl, cream butter, sugar, egg yolk, milk and vanilla. In another small bowl, combine flour, cocoa and salt. Blend dry flour mixture into creamed mixture. Cover dough and chill in refrigerator at least 1 hour, or until firm enough to handle. In a small mixing bowl combine 1/2 cup confectioners sugar, 1 tablespoon butter (softened), 2 teaspoons milk and 1/4 teaspoon vanilla extract and beat until smooth. Shape refrigerated cookie dough into 1-inch balls. Dip each dough ball into egg white and then roll in chopped nuts to coat evenly. Place balls on lightly greased cookie sheets about 2 inches apart. Press thumb gently into center of each cookie. As soon as cookies are removed from oven, spoon about 1/4 teaspoon Vanilla Filling into thumbprint. Gently press unwrapped Hershey's Kiss into filling in each thumbprint. Remove cookies from sheet and cool completely on wire rack. 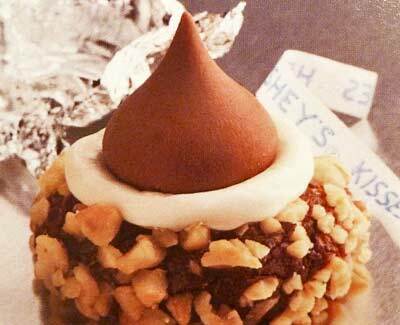 This recipe makes about 2 dozen Chocolate Kiss Thumbprint Cookies. We think these cookies are best they day they are filled. Keep in mind that you can always make both the cookies and the chocolate filling up to 3 days ahead of when you want them - just fill them on the day you plan to eat/serve them! Preheat oven to 325F degrees. Line cookie sheets with parchment paper or silicone liners and set aside. In a mixing bowl, beat the butter, granulated sugar and brown sugar with an electric mixer on high speed, until smooth. With mixer on low speed, gradually beat dry flour mixture into creamed butter mixture until thoroughly combined. Cover bowl with plastic wrap and refrigerate at least 30 minutes, or until dough is firm enough to handle but pliable. In a shallow bowl, place about 1/3 cup turbinado sugar. Shape dough into 1-inch balls and roll in turbinado sugar to coat evenly. Place sugar coated balls at least 1 inch apart on prepared baking sheets. Press thumb into the center of each ball making a 1/2-inch deep indentation. Bake cookies about 10 to 12 minutes, until lightly browned. Transfer cookies to wire racks and cool completely. If the indentations have disappeared, make them again while cookies are still warm. In a heatproof bowl set over a pan of barely simmering water (make sure bottom of bowl does not touch the water), melt chopped chocolate, whipping cream, corn syrup and butter. Stir occasionally until chocolate is melted and mixture is smooth. Remove from heat and let mixture cool until thick but not firm, about 15 minutes. Makes about 1 1/4 cups. Carefully fill each indentation with about 1 teaspoon chocolate ganache. Let filled cookies stand until ganache is shiny and firm to the touch, about 1 hour (or chill for about 30 minutes). This recipe makes about 50 Chocolate Ganache Thumbprints.